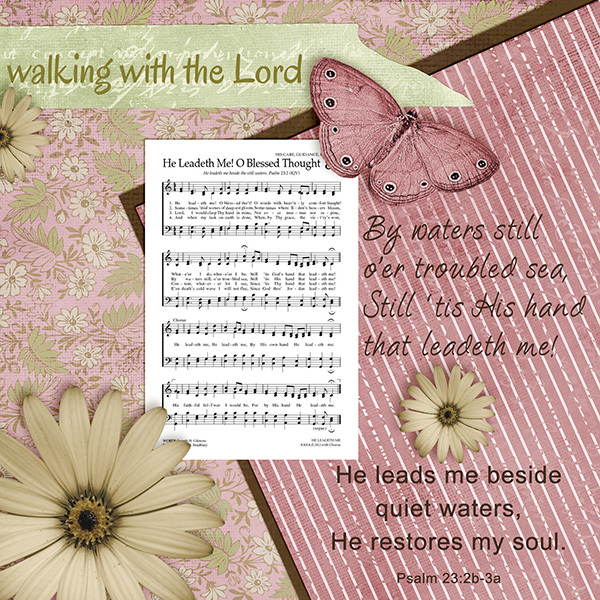 This fortnight Patter chose a lovely hymn which was perfect timing for my husband and I. Please visit Patter's blog here to read her devotional thoughts. My husband and I have our house on the market and have found the house to buy that we want to make our new home but there have been a few little set backs which has made us very much aware of the Lord leading us and guiding us along the way. I would not like to go back to being what I was before I met Jesus and not have the help to make decisions that I now have. Oh what comfort it is to know who is holding our hand and leading us. 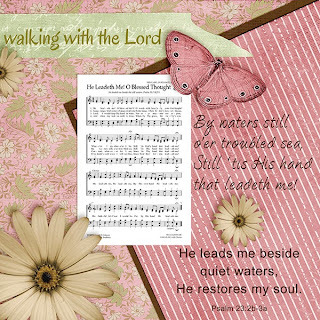 Your page is lovely Ann Marie and what a wonderful scripture you have used to go along with the hymn. How wonderful that we can find peace when we allow Him to lead us ! Your card is absolutely gorgeous! I love the rose tones, but most of all I love your message. To know - for sure - that God is leading and cares right down to the last deatil! Thanks for sharing. You make such wonderful digital creations!